The proprietary Boost midsole delivers premium and resilient cushioning from the first stride all the way to the last. Offers great support and stability without putting too much weight. Many runners agree with the exceptional outsole durability. The Primeknit upper hugs the foot very well and is very durable as well as remarked by a good number of users. A couple of testers noted the Ultra Boost ST’s plush comfort. Some runners value the shoe’s ability to hold up well as a daily trainer or as a marathon option. The Adidas Ultra Boost ST is slightly heavy. Based on the observation of a handful of runners, the Adidas Ultra Boost ST’s oversized heel tab looks way out of place. Adidas added stability and support features to what it calls as the “greatest shoe” ever. The Ultra Boost ST combines premium cushioning in a very stable ride. As can be expected, the arch support is superb for slight to moderate overpronators that piling on the miles will be very enjoyable. After a couple runs in some old, not properly fitted shoes that I had from my brother in law I got hooked with running. It started as an idea to try train for half marathon with some friends. I figured, let’s get serious and have some nice gear for the occasion. Early 2017, after plenty of research I decided to get myself a proper pair of runners. Majority of sources pointed me out towards Adidas Ultra Boost ST, which by many was named the best sneaker of 2017. The shoe looks great, there is no way around it. It comes in countless variations of colors and is a definite head turner. It is a big plus as you can use it as a casual shoe as well as a training road shoe or just take it to the gym – you name it. I see plenty of people on the streets just looking super stylish in them as they walk by. The fact that they are super comfortable, which we will talk more in depth later, allows you to wear them all day long. Probably a great choice for travel etc. I got them for $260 AUS and it was a lot of money at the time, but I figured – better to pay a bit more for the leading shoe than get cheaper two pairs that you will hate. A year and a half later, unfortunately, price did not drop which is frustrating as I would gladly purchase them again on some nice sale. We are dealing here with a PRIMEKNIT material. Super lightweight, breathable four-way stretchy fabric that wraps seamlessly on your foot provide this snug sock feel and do not crease. I personally love to be able to move my front foot a bit and not be caged. The primeknit it is just something that I never experienced before. Love from the fist wear. Was a bit afraid that it may tear while running in bushes, but so far so good. We have a couple of plastic components for support and stability located at the back of the shoe – it will keep your arch firm and steady while not feeling too restricted. It is not a stability shoe though but protects enough. The ST version contains additional pieces for even more advance safety. It adds to the weight of the shoe keeping it in the 300g bracket, but while running it does not feel heavy at all. Even with the case or cage shoe, it is still very flexible. You can bend it in different directions. Lockdown is not the best so if you plan on doing hills or running in the mud, probably tighten your laces, as a couple of times I lost the shoe along the way. Did not know anything about that technology prior to my purchase except what I heard in youtube reviews. I would not go into detail of the Boost itself as I am sure it got covered nicely in many reviews. I would say that it is a great cushioning system. Super spongy, those hundreds or thousands of little pieces combined made a nice base for your feet providing comfort but still maintaining nice energy return, so you can still go fast. The shape of the forefoot just makes your feet naturally roll forward with a nice bounce in each stride. Great for long runs, where you want to just relax while still maintaining a decent pace and be gentle to your joints. I can easily keep an average of 4:30/km on a 10km in them without breaking too much sweat and no pain after running whatsoever. To protect the boost on the outsole and give you a nice traction, we have a layer of CONTINENTAL rubber, inspired by tire technology. It sounds cool and it does give a solid grip and promises a nice durability. I ran in my ultras over 700km – lost the count. Had road runs, bush runs – various terrains. Apart from some minor crack lines and some dipper wear and tear on the front (where you expect the most impact to be) outsole still looks pretty good. I’ve seen some pictures online of people showing their shoes where you can see boost showing thru the wearied boost, but honestly, it is hard for me to imagine how extreme runs you need to be doing to get to that point. I try to run at least 40km a week in winter and much more in other seasons and if I will wash my shoes they would look quite decent. Just in case, I am trying to avoid running in them in wet weather as after such a long mileage on them as I am not sure if traction is still to be trusted. The Adidas Ultra Boost ST is a high end, well-cushioned training shoe. Great for long runs when you just need that extra comfort and like to have a bit of a flexibility. It is not a great shoe for someone who is looking for great stability and support. You are paying a lot, but in my opinion, you are receiving a great product loaded with an amazing technology that should last you for many runs. Again, I have at least 700km on them and it looks like they still got plenty to give. You would not be breaking the speed record in them, but you can still go fast. I would recommend this shoe and if I happen to find a sale somewhere, I would not hesitate to get another pair. The Adidas Ultra Boost ST is the beefier brother of the Adidas Ultra Boost shoe. It’s the stability version of the Ultra boost. It’s heavier (by about 14% ), it has greater support, and it has thicker fore-foot and rear-foot stack heights (about 3 mm more). The Boost midsole delivers premium and resilient cushioning while offering great support and stability. The Boost midsole is responsive but is also durable for those longer runs. This is a great shoe for any range of distance from 5k to full marathons. The ample toe box should be able to accommodate mid-run swelling without any difficulty. The consistency of the cushioning is also an asset. From the first step until about the entire sole gives up, the cushioning remains almost the same. The weight is superb in that it’s light (although marginally heavier than the previous model at 12.5oz for a size 11) and it feels supportive. The added stability compared to the Boost means this lends itself to almost every distance. The multi-density sole provides stability while allowing and promoting a natural running movement. When you run in these shoes, you will really feel the stability that these shoes provide. Similar to other Boost shoes, this shoe includes a Continental rubber sole, which means you can expect a durable and improved grip on all surfaces. The midsole utilizes the brand’s Boost Technology that offers efficient energy-return property and superior cushioning for a more responsive ride. This works hand-in-hand with the Adidas Torsion System that allows the rearfoot and forefoot to move naturally for a more stable heel-to-toe transition. 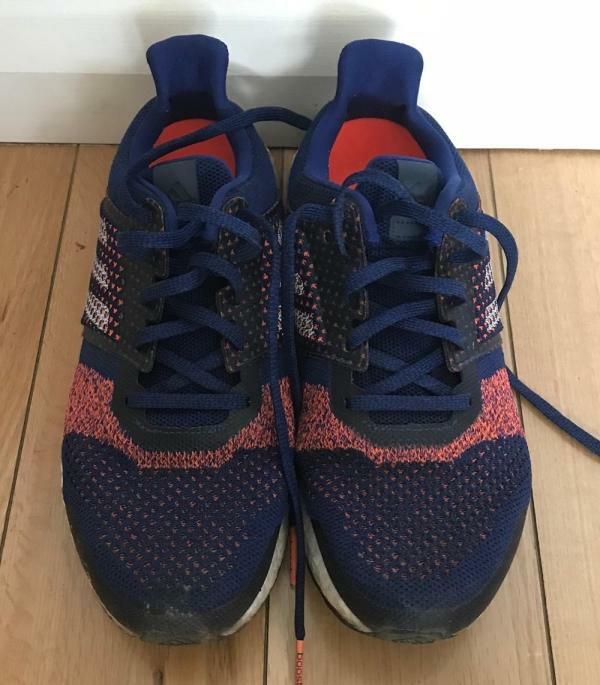 Having said this, the Energy Boost which has a wonderfully well cushioned full-length Boost midsole, but then uses a Dual Torsion thermoplastic device in the midsole, makes the shoe completely inflexible and dead feeling. The Primeknit upper along with the Adidas logo overlays provide the sock-like feel and the Adidas overlays provide the support. The heel counter provides ample heel support and even though there is an odd-looking heel tongue, I didn’t even notice it. The Primeknit is quite stretchable, it is firmer in the parts that really need support. Thus, runners will have flexibility and firmness right where they need it in a one-piece upper that fits like a glove. The toe box on this upper which is wider than most Adidas shoes. This stretch mesh provides a snug but not hemmed in fit. The only drawback is that it is fairly hot when running in warm weather as it doesn’t breathe well. Although the heel collar and tongue are well padded, the heel collar is nearly non-existent and feels a bit sloppy given the inflexible midsole. The faster runner may not appreciate the slightly heavier nature of the shoe. Shoes like the Nike Zoom Fly would be more appropriate. The shoe is at the higher end of the price bracket and may reduce its attractiveness. 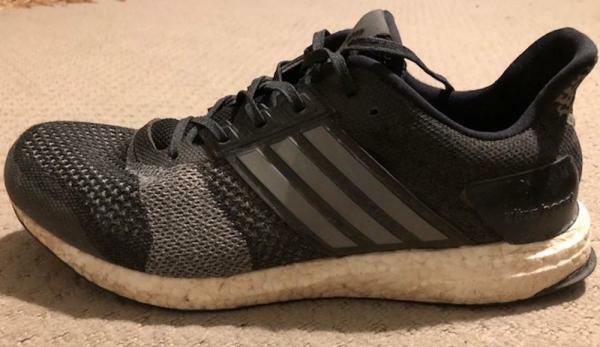 If you are a slight overpronator who like cushion and comfort, consider the Adidas UltraBoost ST. Or if you are a neutral and need more cushion due to mileage, definitely give this shoe a go. A very good shoe for long-distance running and shorter distances. Can be considered slightly pricey but well worth the investment. It's super responsive, fantastic feedback energy return. If you're searching for a shoe that embodies comfort and stability, the Ultra Boost ST is what you're looking for. Adidas comes up with a bigger, beefier, and a more stable version of the shoe that it calls “the best running shoe ever.” The Ultra Boost ST has greater support and has more substantial stack height to provide excellent overpronation control measures. Like its neutral brother, the stability version of the Ultra Boost has 100% Boost midsole, which is 20% more than any of the other Boost models. It has definitely resulted in an extremely-cushioned ride with superior responsiveness. The consistency of the cushioning is also an asset to marvel at. From the first step until about the entire sole gives up, the cushioning remains almost the same. For added measure, the Boost never fails regardless of temperature. The highly-sophisticated Primeknit upper is something that most runners will really love. While it is quite stretchable, it is firmer in the parts that really need support. Thus, runners will have flexibility and firmness right where they need it in a one-piece upper that fits like a glove. The year 2017 sees an update for the Adidas Ultra Boost ST. New colorways and an updated design help to revitalize this stability shoe’s relevance in the market. The Aramis motion capture technology also takes center stage as the basis for how the foot-chamber accommodates the natural shape and motion of the wearer’s foot. A shoe that is designed to be high-mileage trainer has to be very comfortable. With this in mind, Adidas made the fit spacious without being shoddy. The heel is about average with a secured midfoot. The forefoot is where most runners will love the shoe. It has good volume and width and should be a great option for those with slightly wider or inflexible feet. As the training can go on for miles and miles on the road, the ample toe box should be able to accommodate mid-run swelling without any difficulty. Available widths are the usual D for men and B for women. Sizes are accurate and offered to the men’s in options from 7 to 13 and 5 to 11 for the women’s. Adidas continues to use the Continental-made Stretch Web outsole for its durability and traction. Although the outsole looks and feels thinner, it is already proven to last more than the average underfoot protection. The Stretch Web helps the runner maximize his stride as it adapts to the runner’s motion for efficiency and support. Previous Boost models sport only 80% of the Boost midsole while the Ultra Boost ST features 100% of it in the midsole. With 20% more of these TPU energy pellets, runners are sure to have a more responsive ride. The Boost midsole in this shoe number around 3,000 capsules that mass together every time the runner lands and then uses the same force to make it the run even more dynamic. Holding the shoe together and making each transition smoother is a plastic insert called the Torsion System. It helps support the arch and allows freedom of movement for the heel and forefoot. An engineered mesh basically covers the whole upper. It is extremely light and breathable. The Primeknit upper is Adidas’ proprietary digital process of knitting a yarn that adapts very well to the runner’s foot. This sophisticated knitting produces an upper that is flexible in the right areas and provides support to parts that need it. Besides delivering a socklike feel, the Primeknit has gained significance because of its exceptional durability. Midfoot support for stability is featured in the form of the plastic 3 Stripes Logo. The heel also shows a sturdy external heel counter for a more stable heel. 2017 UPDATE: The 2017 colorway-update of the Adidas Ultra Boost ST features some subtle changes to the upper unit. The Primeknit has a tighter and more secure construction, thus potentially accommodating a longer lifespan. The saddle of this update is also made up of knitted material. It’s secured by thin stitches and printed overlays. Connected directly to the shoelaces, these medial and lateral add-ons adapt to the tightening and loosening of the fit. The Aramis motion capture technology was utilized in the making of this shoe’s structure. It makes sure that the final product is able to accommodate the natural shape of the foot, whether it’s idle or on the move.